Cicely Oliver meets the team which helps to boost people’s mental and physical health. WITH no less than five long-standing volunteer organisations operating on the Forth & Clyde and Union canals, Re-Union Canal Boats is the new kid on the block. A social enterprise founded in 2004 by Jay Lamb and Sam Baumber to make canal cruising available to all, Re-Union launched its first boat with the support of three social investors and more than 1000 volunteer hours. 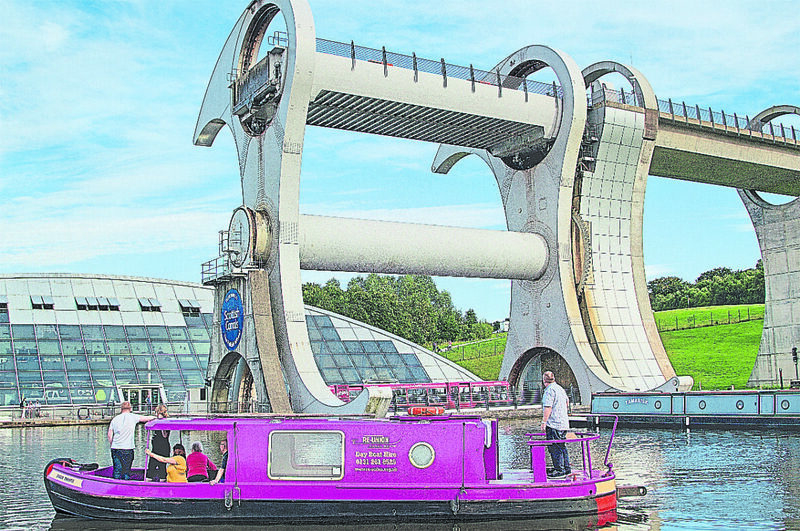 Above: Re-Union lock keepers taking a hire boat down through Falkirk on the Forth & Clyde Canal. Photo by Jonathan Mosse. Fast forward to today and the organisation has supported almost 8000 volunteers, accumulating 10,900 hours of volunteering. Re-Union uses a mix of funding and income generation to support its projects. Lesley Young, development manager, describes her job as constantly seeking new projects and initiatives to meet the needs of the community – whether bespoke projects for specific groups or activities ranging from guided walks, litter picking and recycling, through to health and employability programmes. At the heart of all they do are the needs of the local communities and the canals: getting people out and about and active alongside the waterways. Re-Union has two trip boats, which form an integral part of much of what the team offer to their clients and provide income. Lochrin Belle, based in Edinburgh, is a 60ft wide beam, available for static hire or cruising with skipper and crew provided. The vessel is also the base for afternoon tea, gin tasting and Santa cruises. 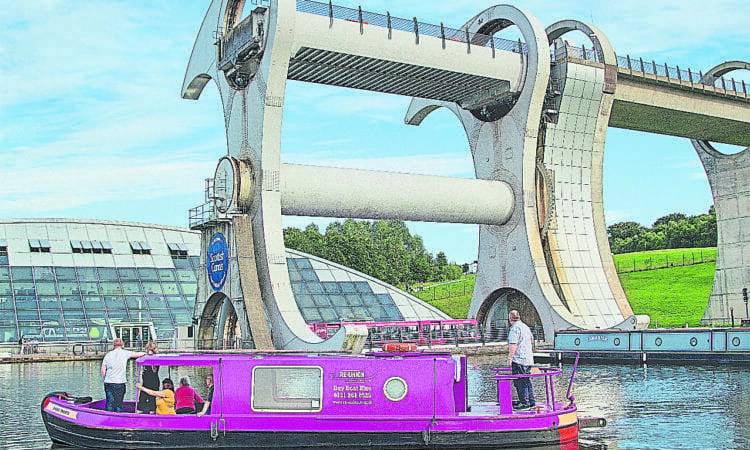 Jaggy Thistle (pictured above: photo by Jonathan Mosse), a 32ft day boat based at Falkirk, is available for self-drive. Setting out from Falkirk, there’s time enough to ascend the Falkirk Wheel and experience the Falkirk Tunnel before returning to base. 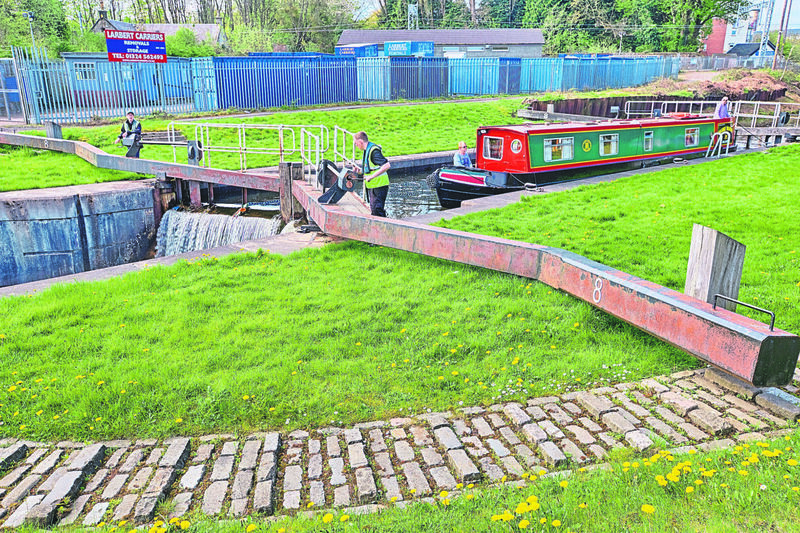 Apart from operating the two boats, another of Re-Union’s successful projects is that of lock keeping on the eastern side of the Forth & Clyde Canal. As well as the practical knowledge and understanding of how to operate lock gates, the volunteers are taught the requisite health and safety requirements for working with the public and beside the water. Volunteers also have the opportunity of learning to crew and skipper a boat, with the ultimate aim of gaining the RYA Inland Waterways Helmsman’s Certificate. Re-Union is an official RYA Training Centre, and some volunteers are now also official RYA instructors. I met a group of Re-Union volunteer lockies at their Falkirk base beside Lock 16 as they prepared for a busy day of transiting hire boat customers and local boaters along the canal. With operations required between lock 20 on the summit near Banknock and lock 3, at the eastern end of the canal beside the Kelpies, Richard Fox, operations manager, assigned people to different sections of the canal and ensured everyone had the necessary lifejackets, windlasses and transport, with lock-wheeling a fundamental part of the overall operation (not just efficient on the long stretches between locks, but good for fitness too). Richard says his aim is to attract, recruit and retain volunteers who come from all backgrounds and walks of life. From retired professionals to those referred via a support agency, everyone mucks in. Some folk volunteer for just a couple of hours a week, others turn out on an almost daily basis. At present some 40 volunteers come out on a weekly basis to help boats through the locks. Apart from fun, friendship and spending time outside, other attributes the volunteers cite as having been gained from their time on the canals include self-respect, confidence, having a focus to life again, enjoying a challenge, fitness, organisational skills, and employability… the list goes on. With such a mix of people and personalities, Re-Union also sees a breaking down of barriers and removal of preconceptions from its volunteers, and a better understanding by individuals about one another. What was apparent was that everyone I met had most definitely caught the canal bug! Mental health being much on the public agenda, with the aim of removing the stigma of mental health issues, I was impressed that several of the group made relaxed and open reference to their own issues with anxiety or depression, and how much working outdoors, spending time on the canal, has helped them. 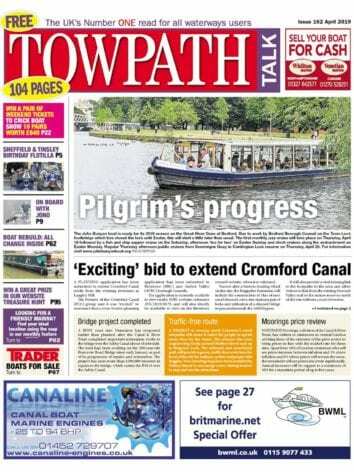 There’s so much canal-related activity that goes on below the radar but that makes a significant and positive contribution to people’s lives. It would be difficult to overestimate the benefits volunteers get from their involvement with Re-Union. Apart from the obvious feel-good factor, all the skills learned are practical and transferable in some way, helping those who have been out of the job market – for reasons ranging from redundancy to long-term health issues – enhance their CVs and get back into work. Even chatting to boaters as they go through the locks translates very neatly into customer care, as is apparent from the positive feedback received from every boating customer’s feedback form. And volunteering on the canals always makes for interest from potential employers who are curious to learn more about their local waterways. Re-Union does much more than I’ve been able to describe here. For more information, visit the website at www.re-union.org.uk.